Chesterhill Produce Auction in Morgan County. Image courtesy of Tom Redfern. Rural Action has been awarded a USDA Rural Business Enterprise Grant to support the Southeast Ohio Food Hub Network, three food hubs that provide access to food, agricultural business training, and employment opportunities for people in Perry, Athens, and Morgan counties. These counties, located roughly an hour from Columbus, Ohio, have all been classified by the Appalachian Regional Commission as “distressed,” according to Tom Redfern, Sustainable Agriculture Coordinator with Rural Action. “Distressed” means many things, but in this part of Ohio, the classification means little access to healthy food, chronic illness and obesity, as well as few employment opportunities that provide a living wage. The employers that are available are often in other cities. For example, people associated with one of the hubs, the Chesterhill Produce Auction located in Morgan County, drive almost an hour to reach their workplaces every day, according to Redfern. The RBE Grant funds, administered through Rural Action, will help the tri-county food hub network establish permanent infrastructure, which will in turn provide farm-based businesses a place to market their goods and extend their reach to markets in other cities. The funds will also provide technical and legal assistance, as well as agricultural training and professional business coaching. Grant funds will also provide for a refrigerated warehouse at the ACEnet Nelsonville Incubator, which will allow the storage of food shipments heading to Columbus and other markets in Ohio. 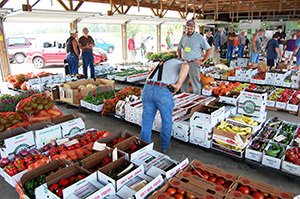 The three hubs have different, but complementary, roles in supporting over a million people in this rural area of the state: Chesterhill Produce Auction is used by hundreds of growers as a place to sell produce to other businesses in the region, such as restaurants, schools, hospitals, as well as individual customers. The ACEnet Nelsonville Incubator offers services and resources to new and existing businesses, as well as counseling, technical assistance, and commercial space. The Village of Somerset hosts a farmers market for local growers and customers. Redfern believes movement toward locally sourced food is an opportunity for southeastern Ohio. By increasing local production and consumption, Redfern hopes the area can recapture millions of dollars into the local economy. “Since Chesterhill’s beginning in 2005, it’s contributed $2 million to that economy,” Redfern says.